After announcing intent to produce mobile titles for smartphone like iPhone earlier this year, Nintendo on Wednesday announced "Miitomo," a freemium app scheduled to see release in the first property will see release in March 2016. The Japanese gaming giant announced Miitomo during an investors conference in Tokyo, and while most expected a gaming release, The Wall Street Journal describes the upcoming title as more of a communications app. 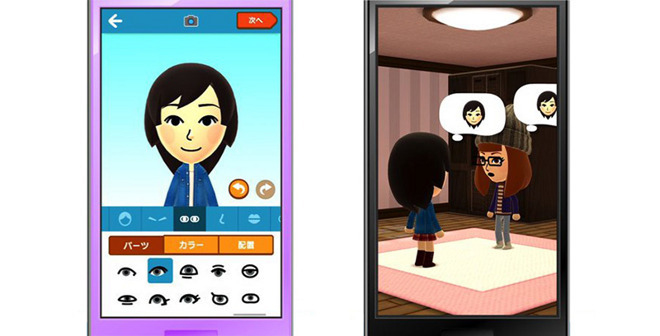 In Miitomo, users can design their own "Mii" avatars, a feature introduced with the Wii console years ago, and talk to other app users. According to executive Shinya Takahashi, the app's mechanics will encourage people to open up about themselves. Exact "gameplay" was not discussed, though Nintendo plans to market in-app purchases that will somehow figure into the equation. Miitomo is the first of five mobile apps Nintendo is developing for release by March 2017. Initial estimates pegged a first launch before the end of 2015, but CEO Tatsumi Kimishima said the company needs more time for proper promotion. Nintendo also announced a new membership service called My Nintendo for storing character and game data in the cloud. Users will be able to migrate files and other online assets between mobile operating systems and consoles, while a built in communications module will enable online chats. Nintendo's plan to bring gaming titles, including classic franchise properties, to mobile operating systems like iOS was revealed in March when the company announced a partnership with mobile app developer DeNA. As part of the deal, the two firms bought into each other for $181 million.